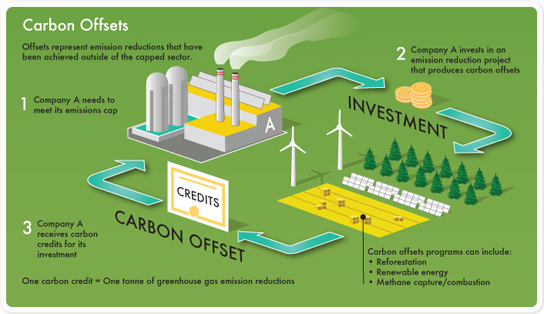 There are two markets for carbon offsets. In the larger, compliance market, companies, governments, or other entities buy carbon offsets in order to comply with caps on the total amount of carbon dioxide they are allowed to emit. This market exists in order to achieve compliance with obligations of Annex 1 Parties under the Kyoto Protocol, and of liable entities under the EU Emission Trading Scheme. In 2006, about $5.5 billion of carbon offsets were purchased in the compliance market, representing about 1.6 billion metric tons of CO2e reductions. In the much smaller, voluntary market, individuals, companies, or governments purchase carbon offsets to mitigate their own greenhouse gas emissions from transportation, electricity use, and other sources. For example, an individual might purchase carbon offsets to compensate for the greenhouse gas emissions caused by personal air travel. Many companies offer carbon offsets as an up-sell during the sales process so that customers can mitigate the emissions related with their product or service purchase (such as offsetting emissions related to a vacation flight, car rental, hotel stay, consumer good, etc.). In 2008, about $705 million of carbon offsets were purchased in the voluntary market, representing about 123.4 million metric tons of CO2e reductions. Some fuel suppliers in the UK offer fuel which has been carbon offset such as Fuel dyes. Offsets are typically achieved through financial support of projects that reduce the emission of greenhouse gases in the short- or long-term. The most common project type is renewable energy, such as wind farms, biomass energy, or hydroelectric dams. Others include energy efficiency projects, the destruction of industrial pollutants or agricultural byproducts, destruction of landfill methane, and forestry projects. Some of the most popular carbon offset projects from a corporate perspective are energy efficiency and wind turbine projects. Carbon offsetting has gained some appeal and momentum mainly among consumers in western countries who have become aware and concerned about the potentially negative environmental effects of energy-intensive lifestyles and economies. The Kyoto Protocol has sanctioned offsets as a way for governments and private companies to earn carbon credits that can be traded on a marketplace. The protocol established the Clean Development Mechanism (CDM), which validates and measures projects to ensure they produce authentic benefits and are genuinely “additional” activities that would not otherwise have been undertaken. Organizations that are unable to meet their emissions quota can offset their emissions by buying CDM-approved Certified Emissions Reductions. Emissions from burning fuel, such as red diesel, has pushed one UK fuel supplier to create a carbon offset fuel named Carbon Offset Red Diesel. Offsets may be cheaper or more convenient alternatives to reducing one’s own fossil-fuel consumption. However, some critics object to carbon offsets, and question the benefits of certain types of offsets. Due diligence is recommended to help businesses in the assessment and identification of “good quality” offsets to ensure offsetting provides the desired additional environmental benefits, and to avoid reputational risk associated with poor quality offsets. Offsets are viewed as an important policy tool to maintain stable economies. One of the hidden dangers of climate change policy is unequal prices of carbon in the economy, which can cause economic collateral damage if production flows to regions or industries that have a lower price of carbon—unless carbon can be purchased from that area, which offsets effectively permit, equalizing the price.